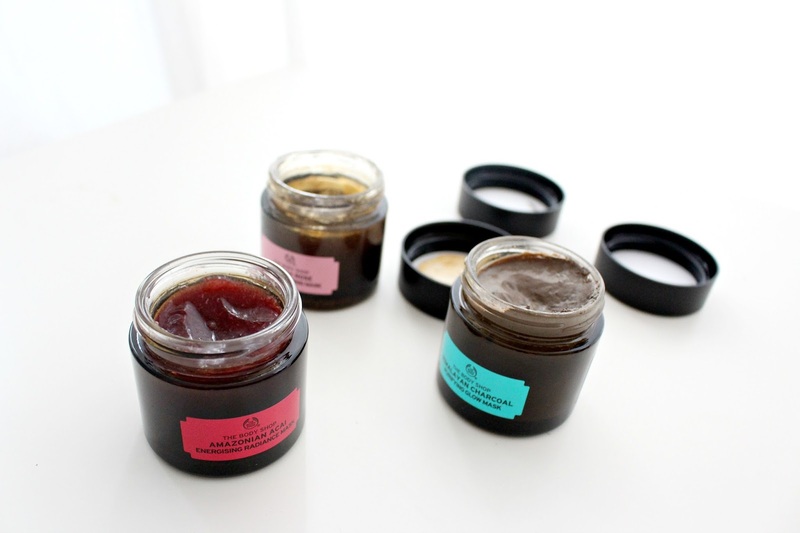 Recently The Body Shop released a line of face masks, they retail for $28 CAD/USD and contain 75mL of product. I'm not sure if it's the fact that masks are so on trend right now but I was so intrigued by this line! So many interesting combinations of ingredients and textures. They are all either vegetarian of vegan, which is so odd to think about animal products being in skincare. It is not something I honestly look out for but I am glad this has none. 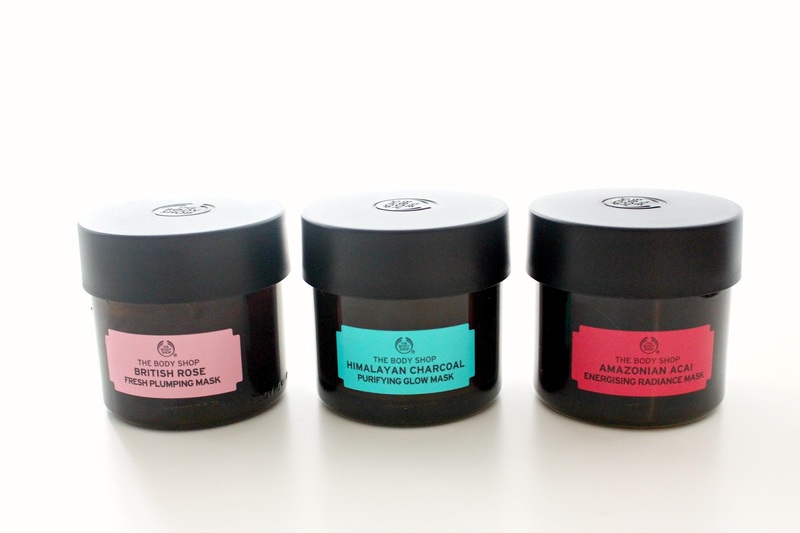 These masks are also formulated without parabens, paraffins, silicones or mineral oils. For reference, my skin is oily and acne-prone but not sensitive. 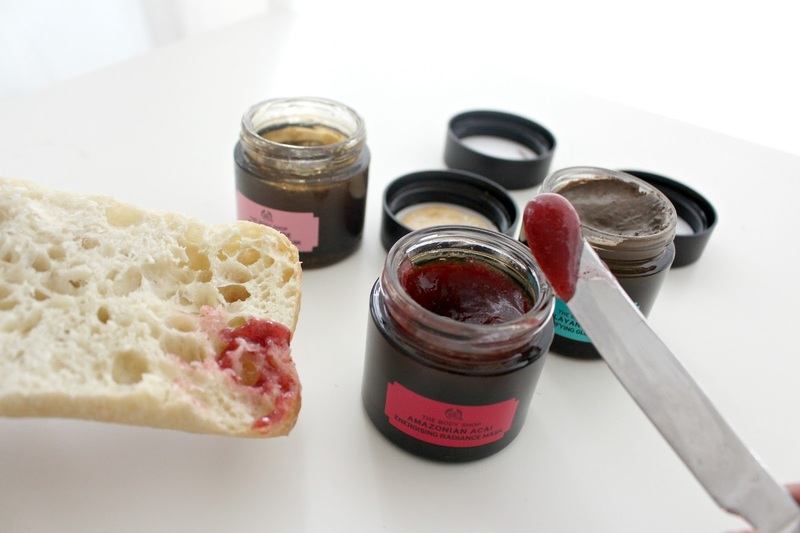 The first mask I tried in the line is The Body Shop British Rose Fresh Plumping Mask. " Inspired by the European bathing rituals, our 100% vegan refreshing gel face mask is infused with real rose petals, rose essence, rosehip oil and organic Community Trade aloe vera." As someone with oily skin I tend to reach for anything clay, charcoal, detox so this mask was incredibly refreshing in more ways than one! It was so nice to use something that felt cooling on my skin, it adds just enough moisture but by no means leaves my skin feeling greasy. It has a great light gel texture. As for the smell, DELICIOUS. I love everything from the British Rose line and this is no different. Maybe it is the best of the line, it smells like a rose jam without being to floral and "old ladyish". I mentioned this one in a recent Favourites Video. Up next is The Body Shop Himalayan Charcoal Purifying Glow Mask. Oh baby, this one is glorious. 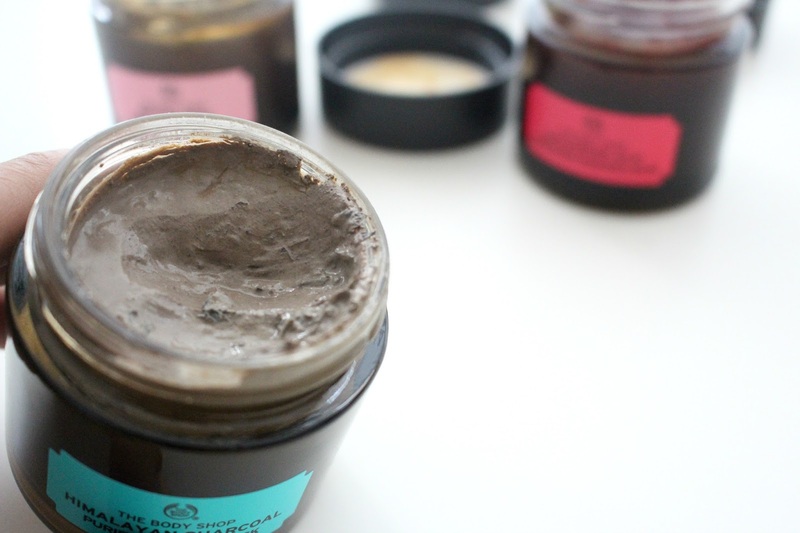 "100% Vegan Himalayan Charcoal Purifying Glow Mask is a beautifying mud-textured exfoliating mask." Key ingredients include bamboo charcoal from the Himalayan foothills, community trade tea tea oil from Kenya and Green Tea Leaves from Japan. I have never spent the cash on a Glam Glow mask but this mask totally satisfies that craving. I've tried a lot of masks over the years and this mask truly left me feeling immediate results. My skin felt so clean, soft and clarified without feeling dry and tight. The only downside is the green tea leaves get stuck to your face and are hard to wash off. That is a small price to pay for how glorious my skin felt after. 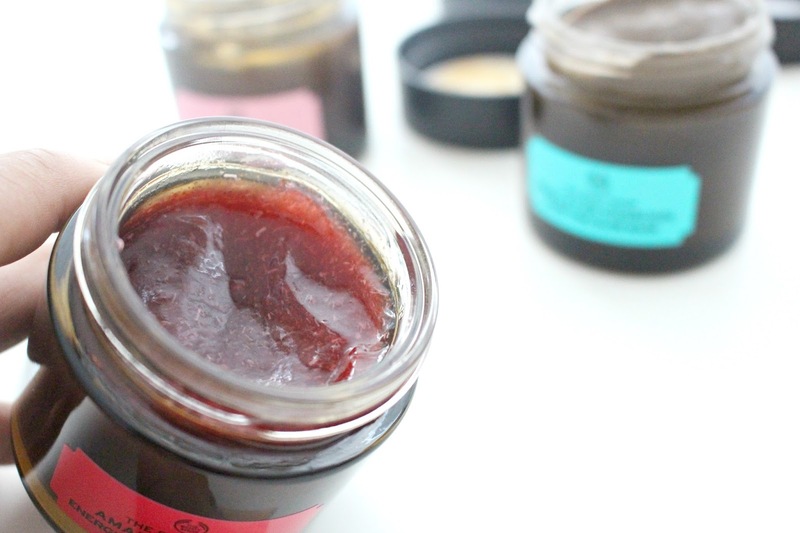 Lastly is The Body Shop Amazonian Acai Energizing Radiance Mask. "Inspired by the rituals of Amazonian tribes, our juicy 100% vegan face mask is a bouncy blend containing acai berry, guarana and babassu oil. 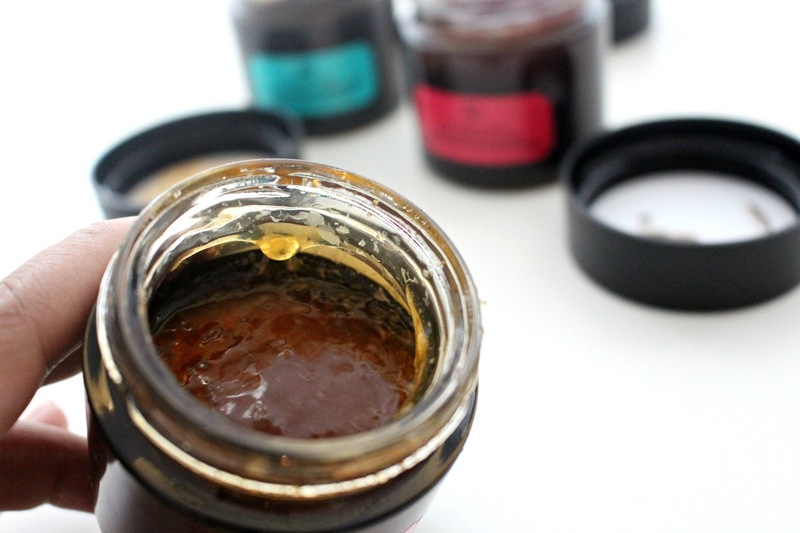 This vibrant face mask exfoliates and invigorates sleepy skin to help it look wide awake." I don't have as much experience with this mask as I do the others but the 2 times I used it, it felt great! It looks like straight up strawberry jam and has little grains in it. I did however wake up with a reaction on my face the second time I used it, I am not blaming this mask.. I have been doing a few other new things but just a thought! Overall I think these masks are fabulous. I cannot recommend the whole line but from what I have tried, I'd say figure out which one will work for you and buy it, now! i am willing on trying one soon ! i am thinking of the Charcoal Purifying Glow Mask for my oily skin !